Confidence from the Ground Up with the TOP SELLING High Heel Protectors on Amazon.com. These Stylish High Heel Protectors in a fantastic value 15 pair multi-pack. Ideal if you want to give your wedding or event guests the STAR treatment without the red-carpet cost! Have you ever been at a wedding or event in heels. Remember that sinking feeling? What about cleaning the mud and dirt off afterwards. Or maybe they were beyond repair? Beautiful shoes ruined! 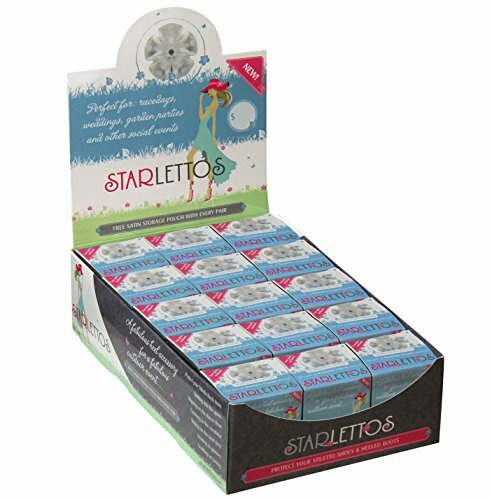 Starlettos Crystal high heel protectors are here to put an end to the pain and frustration of damaged heels. These clear temporary shoe heel attachments slip over the end of your heel and provide instant no-sink support as you negotiate the lawn at a garden party or outdoor wedding. Invented in Australia in 2009, and only $15.99 per pair these little wonders are a fabulous investment if you are a shoe-lover! Available in over 20 countries, they are fast becoming the world's favourite heel protector because they are both strong and stylish while being almost invisible on grass. Featured in the celebrity swag-bags at the Emmys and Oscars, and guests of honor at the wedding shower of Courtney Mazza (now Lopez) these designer high heel protectors have really been dancing with the stars. So join Meryl Streep, Sofia Vergara and Julie Bowen and see what everyone's talking about. Simply hit Add to Cart. If you have any questions about this product by Starlettos, contact us by completing and submitting the form below. If you are looking for a specif part number, please include it with your message.